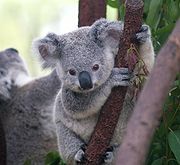 The special adaptations that the Koala has to succeed in their environment is: koalas sharp claws to climb eucalypus trees and a pouch by the mother koala's rear end so that a baby koala can stay in the pouch when the mother koala climbs.They have thick fur to keep the koala warm when it is cold outside. The fur grows close together to keep the skin dry. Many people think that a koala is a bear but they are wrong. Koalas are marsupials.They are also nocturnal and are herbivores. The koalas closest relative is the Wombat. Koalas are found in Queensland and the estimated amount of koalas are 50,000. There is also life in New South Whales in Aulstrlia and the estimated amount of koalas are 15,000. Koalas eat and live in Eucalypus trees people are cuttting down all of the trees and koalas are becoming extinct. If the koalas didn't adapt to eucalypus trees they wouldn 't be able to eat or live. Koalas like to live alone. They are nice to one another and sometimes more than one koala lives in a tree but they only stay on their own branch. Koala mothers and babies are the only koalas that live together. The koalas adaptation is not realy the behavior that the koala uses it is really a physical adaptation. Other animals that live in the same environment as koalas and have similar adaptations like bears. Koalas are very similar to bears. Bears have sharp claws to climb just like koalas. Koalas are very fun to reseach about! this is a mother koala!! Bibliography: google.com www.giftlog.com/pictures/koala_fact.htm The book Koalas aren 't bears.